“National Conference on Facilitation of Skill Development and Startups in Food Sector” Organised jointly by Association of Food Scientists and Technologists (India) Pondicherry Chapter and Department of Food Science and Technology, Pondicherry University, on 19th March 2018, Culture and Convention Centre, Pondicherry University. Innovations in food processing and food product development are happening at a fast rate continuously developing newer products and technology. Food processing is the fastest developing sector in India. With increasing urbanization and fast rising buying power of the middle class pollination is driving the industry at an incredible pace. India with its wide traditional food base and crave for spices, snack and health food sector is giving the strong base for the same. However, the short supply of skilled work force and reluctance of youth to take up entrepreneurship are the two major weaknesses in the Indian food processing sector. Recognising the future scope and potential of the sector, the current government is giving a big thrust for skill development and is encouraging the start-ups in the area of food entrepreneurships. The government has also increased the budget of the Ministry of Food Processing Industries two fold which indicates the increasing importance being given to the sector.In view of this, the current conference has been planned to bring the food scientists, technologists current and to be entrepreneurs together on one platform to start dialogue and to stimulate spark among the young minds. The resource persons come from academia, industry and administration. A total of 150 delegates participated in the Conference. 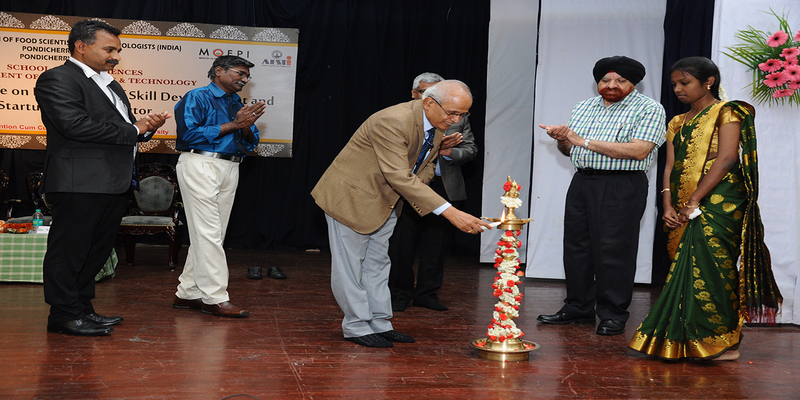 Inaugural function of the Conference was held at the Culture and Convention Centre, Pondicherry University. Dr. C. Vasudevappa, Vice Chancellor of National Institute of Food technology Entrepreneurship Management (NIFTEM), a premier Institution of Ministry of Food Processing Institution, New Delhi was chief guest and Prof. Gurmeet Singh, Hon Vice Chancellor of Pondicherry University presided over the function. Dr. N. Bhaskar, Scientific Advisor to Food Safety and Standards Authority of India was the guest of honour. Dr. Prathap Kumar Shetty, Organising Secretary and the professor and Head of Department of food science and technology welcomed the gathering and outlined the importance of the quality skill development for effective entrepreneurship and start-ups in the food sector. He stressed the point that food sector is the sector which is the only sector which is growing in an exponential growth and the sector can absorb any number of new businesses which can come up and everyone can make a profitable business as long as you are innovative and scientific. Dr.C.Vasudevappa stressed the importance of food processing and nutritional security in India. Despite of diverse and self-sufficient food production in India still there is lack of nutritional security among different population. He listed out the role of NIFTEM in catering the various stakeholders such as entrepreneurs, food processing industry, exporters, policy makers, government and existing institutions for assisting in setting up food standards, businesses incubation and can also about knowledge sharing. He also insisted the need of trained manpower in the start up of food processing sectors and also about bridging the gap between the academic institutions and food industries. Dr. N. Bhaskar, addressed about the skill development, startup requirements and guidelines and food safety and standards in India. He also spoke about the complexity and challenges of food safety testing and analysis onsite and laboratory, rapid methods and novel devicesfor testing food adulteration. He further explained role of FSSAI in creating awareness by providing training programmes for persons who are involved or intend to get involved in food businesses. Prof. Gurmeet Singh delivered a motivational speech and narrated the success stories of few startups in India. He also cautioned the post-harvest losses in agrofood markets and explained how the surplus crops and food grains can be utilized through different food processing methods. He also adds that India as a market holds tremendous potential for food-tech and as more players enter this space, it will bring opportunities and innovation that benefit the entire ecosystem. He also spoke about the quality and safety of food products availed commercially in developed countries like USA, Canada and European countries and described in detail about the opportunities and improvements for domestic startups to compete at global level.He quotes the importance of networking and co-ordinating of various food processing and management institutions and stake holders in the same field both in India and Abroadfor betterment of nutritional safety and security. Organising committee profusely thanks the AFSTI for kind sponsorship.